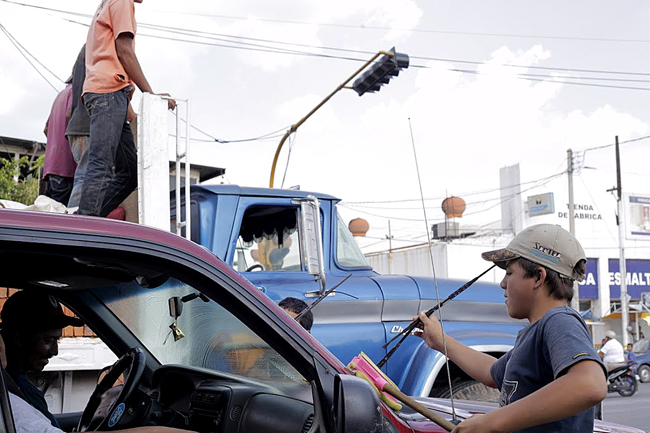 Victor Garcia is 12 years old and spends his days at a busy intersection where he juggles fruits and washes windshields. Under the Mexican Constitution, it is illegal for children under the age of 14 to work. And children between the ages of 14 and 16 can only work for a maximum of six hours a day. However, it isn’t out of the ordinary to encounter children selling gum in the streets, wiping windshields during red lights and earning less than the equivalent of $10 after working eight hours a day. As a child I would come to Mexico every summer, but I wasn’t aware of the violence, corruption and poverty. All I saw was the beauty in this country’s culture and its people. Now that I’m older I want to explore different aspects of Mexico in order to gain a better sense of politics, its economy and its relationship with the U.S. I decided to travel to Mexico this summer to do some reporting on children’s education, child labor laws and immigration. I believe that one of the reasons for our distant relationship with this neighboring country is our lack of knowledge when it comes to trying to understand why people migrate to the U.S.
Oportunidades and The National System for Integral Family Development, DIF, are two programs fighting the exploitation of children through different approaches. DIF is a state-run family services program. It provides assistance to families living in poverty and it works on family development, while Oportunidades is a cash transfer program in Mexico that was founded in 2002 in an attempt to end poverty. The program gives cash to low-income families who qualify based on a socioeconomic evaluation. Victor Alfonso Perez asks for money after juggling fire in the streets of Ocotlan, Jalisco. My first stop on this trip to Mexico was Ocotlan, Jalisco. Last month I visited a small industrial town called Ocotlan, Jalisco, population approximately 90,000 people. I approached a group of kids who looked to be between the ages of 8 and 14 and asked if they would be willing to talk to me about their lives as child workers. One of the kids replied, “We’re not working. We’re just playing with marbles,” and in a split second all of the children who had been washing windshields dropped their buckets and joined their friends on the sidewalk. I had a lengthy talk with the eight kids as I tried to convince them that I wasn’t with the government. Before turning away, one of the oldest girls in the group approached me. She mentioned that the kids had already made the mistake of speaking with DIF representatives and that they weren’t going to do it again. Representatives from DIF had managed to investigate futher and ended up separating the child from his parents, according to the young girl. So understandably these children kept their guard up when I approached them. One of the younger boys in the group came up to me and we began to talk. He told me that he went to school, but had to work in the afternoons. He admitted that he gave half of the money to his father and kept the other half because he was saving for a new pair of sneakers. On a good day the boy said he could make 150 pesos, the equivalent of $11. He makes this money by washing windshields and juggling in the streets. Patricio Alvarez and friends take a break from wiping windshields. 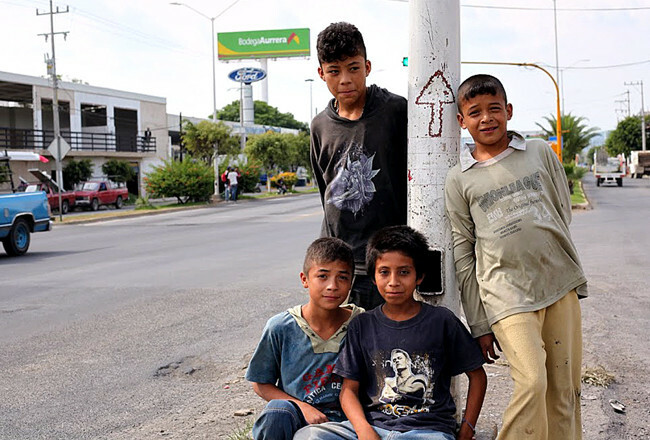 These young men are among the many boys and girls who make up the "Crucero" in Ocotlan, Jalisco, where every traffic light is busy with child workers. Thankfully, there has been a decrease in the number of children working in Mexico, according to a study done by the World Bank, UNICEF and the International Labor Organization. Part of this decrease is due to a welfare program called Oportunidades (Opportunities). One of the program’s requirements is that the parent receiving the cash, in most cases the mother, ensures their children visit the doctors and attend school. Oportunidades’ infrastructure is innovative in the way it makes the families’ children the breadwinners. However, the program’s cash-handout system is one of the issues holding it back from actually addressing the underlying causes of poverty. The chair of economic development in the municipality of Ocotlan, Monica Tapia Villarruel, said that one could see the shops set up outside the cash-handout center where people would spend the money they had just received on clothes and shoes, instead of milk, bread and the basics. Villarruel said that families would continue receiving money as long as they can get their children to school and prove that they are relatively healthy. However, as much as the government wanted this money to go toward improving people’s way of life, there is no way to monitor where the money is going. Patricio Alvarez wipes down a car windshield at a red light. According to the Mexican Constitution, children under the age of 14 are not allowed to work. Therefore the children keep spending their afternoons out on the streets, begging, washing windshields and juggling fire. Maria Elisabeth Sanchez Aguirre, an ex-coordinator for Oportunidades, said she believes that children in Mexico lack the motivation to stay in school. Parents and a lack of education play a big part in Mexico’s inability to progress financially. Aguirre emphasized that Oportunidades isn’t reaching the people who truly need it. One of the program’s downfalls is that it has created a bit of a hold on people. “People are becoming very dependent,” Aguirre said. The program is about “giving you the opportunity to move forward. “But the people don’t do it. Why? Because they are dependent on the government sustaining them for the rest of their lives,” Aguirre said. As much as I’d like to focus on the positive things Oportunidades has brought to Mexico, I can’t ignore the errors in the system. I would push for the government to spend more time fixing the cash handout system and not leaving the program to be just a catalog of low-income populations for politicians and elections. Oportunidades could create a new form that evaluated families based on income, household size, and other expenses. And to ensure the money was being used correctly, the program could implement home visits to keep track of how the money was helping people out of poverty, as well as monitor families who no longer required financial assistance. Oportunidades and DIF could learn a thing or two from a foundation called Fundación Enrique Jacob. It’s a non-federal program set up to help the city and municipality of Naucalpan in the state of Mexico. Naucalpan was a municipality known for its economic prosperity. 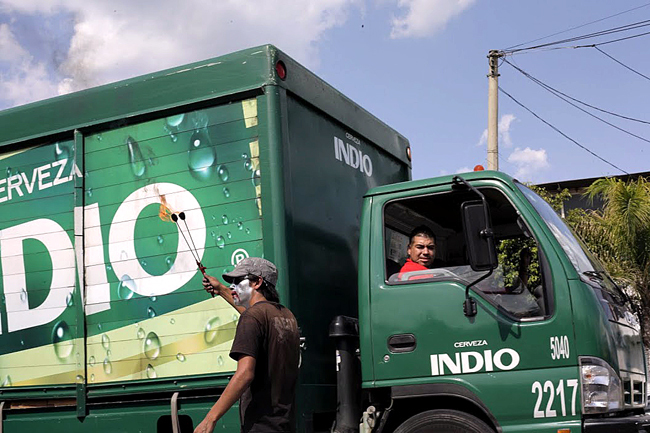 It recently fell from first to 30th most prosperous municipality in Mexico. 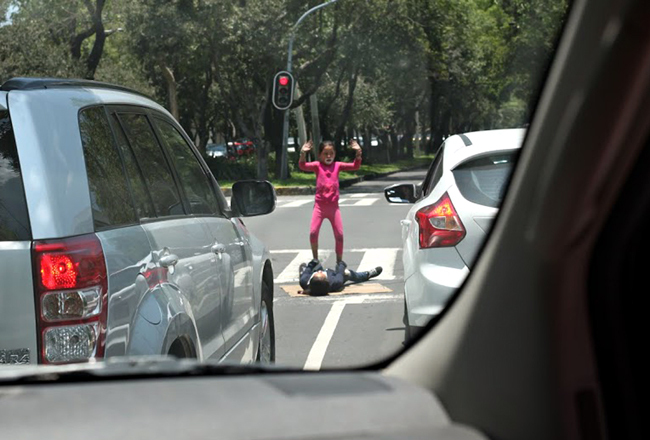 Rosalie and Juana Meninos are two cousins who do acrobatic tricks and beg for money along a street named Reforma in Mexico City. The foundation began working in March and has already reached over 42 small communities around Naucalpan, giving information sessions and handing out paperwork. One way the foundation is setting out to make changes in the community is with a program called Mayores Oportunidades de Crecimiento. Given the lack of job opportunities in Mexico, this program is helping people start their own small business. Through classes lasting two days, fours hours each, the foundation sets out to guide people through the process of starting a business. If a person has a business plan in mind the foundation helps them push the project until it’s done. “I am convinced that in order to really create structural change, or changes that can modify a municipality, you have to work from within the community,” said Jacob, the foundation’s namesake. Jacob points out the lack of jobs as one of the reasons for Mexico’s inability to progress. Also, he said he believes the main issue with Mexico’s education system is the lack of qualified teachers. “What we are doing is proposing a new educational system through an organization called Redes de Tutoria,” Jacob said. The foundation is collaborating with schools in the community so that students arrive to class with their own lesson plan. Not only are they learning to be more independent, they’re also teaching their peers and teachers. Mexico is one of the leading countries with bullying being a serious issue. Jacob and his foundation plans to tackle bullying through free classes held at public schools throughout Naucalpan, where teachers, students and parents will be able to learn more about this social issue. “Everything is interlaced,” Jacob said. “You have to start working with children and young people in order to create change that lasts. And unlike federal programs that change every time a new mayor and president are elected, the foundation plans to be around for 25 years. Francisco Gomez, Jesus Ramirez, Luis Ramirez and Antonio Ruiz are four of the kids working in the streets of Ocotlan, Jalisco. They work in groups, washing windshields and juggling in the streets. “The idea is to generate change in the short, medium and long run,” Jacob said. DIF and Oportunidades work independently from each other. However, the accidental partnership between the two programs ends up benefiting families in need. A study called Education in Mexico by Inter-American Dialogue highlights the issue behind Mexico’s education system as it was bettering in 2012. Enrollment in all grades has increased drastically since 2010. However, “poor students have no option to attending low-quality public primary and secondary schools that do little to raise their productivity or prepare them for the university.” Students going to public universities do not pay tuition. Instead of spending more money on university students, Mexico could use funds to improve the quality of education and enrollment in primary and secondary school. DIF could enlist more support from the government if it wanted to put a stop to underage children working the streets of Mexico. This would benefit the children and increase the time they could be spending studying for school and doing homework. As long as Mexico is working toward better education for all, it should spend more time on the things preventing children from staying in school. DIF social worker and lawyer Alma Carolina Cerón Alvarado said that when the Public Ministry sends parents to the DIF offices for a mental health assessment, the DIF social workers inform them about the programs they qualify for. Education can reshape Mexico and its people, who are more than capable of improving their own way of life if provided with the tools to learn, not just buy. Oportunidades and DIF are two programs with the ability to bring education to the children. The money should be regulated and aimed at getting kids through the school doors. And DIF could enforce children’s attendance in school by putting more responsibility on the parents. Fernandez is a journalism senior from San Antonio. Follow Fernandez on Twitter @HelencarolineF.